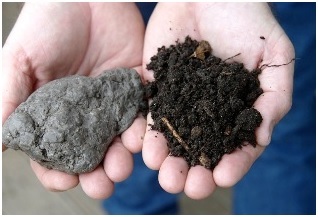 "Unhealthy and healthy soil from the same site." All of the organic amendments directly or indirectly help loosen and soften the soil. The key to friable, productive soil is abundant life in the soil. When the soil is healthy by being rich with biological activity, it will not erode or compact during rains, it will hold moisture at just the right level - thus cutting water costs, and it will create excellent crop production. Healthy soil contains significant microbiotic life. The microbes create organic matter that helps build the glue in the soil that creates the texture that allows rain and irrigation to soak in, oxygen to breathe in and carbon dioxide to breathe out. Use this thought model. Before choosing products to use on your property, ask this: if I purchase and use this product, will it help or hurt the life in the soil? When the beneficial bacteria, fungi, protozoa, insects, earthworms and others are healthy, growing and reproducing, the soil's chemistry, biology and structure will be proper and the dirt will be soft, crumbly and productive. · Rock minerals - lava, granite, greensand, zeolite, gypsum, etc. · Sugars – molasses, cornmeal, beet pulp, etc. Beneficial microbe products also help by speeding up the establishment of quality soil life. For more detailed information on soil building, check our new book – Organic Management for the Professional.